Learn how to limit your risk in any trade. How to keep your upside open so that you literally have no profit limits. Use Income Methods 1 thru 12 to Bulletproof your investments so there is no longer possibility of loss but still room to grow. Using Income Methods to augment your returns. Special instructions on how to set up a bullet-proof from the beginning trade that can play either side of the market. 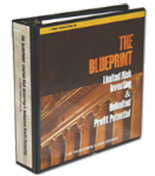 Whats better than owning the premier work on limiting risk in the stock market? Owning that work and the companion videos to really fine tune your RadioActive Trading skills! Learn how to limit your risk in any trade. How to keep your upside open so that you literally have no profit limits. Use Income Methods 1 thru 12 to Bulletproof your investments so there is no longer possibility of loss but still room to grow. Using Income Methods to augment your returns. Special instructions on how to set up a bulletproof from the beginning trade that can play either side of the market. Fusion subscribers can follow the currently open and historical trades of the RadioActive Trading staff including Ernie Zerenners trades (founder and owner of PowerOptions). Fusion also has a Report Tool for researching new Married Put positions, a Stock Insurance Tool to view Married Put possibilities on stocks you may own and a library of lessons that help you master the techniques discussed in The Blueprint. Note: A subscription to Fusion does not give you access to The Blueprint. Patented option trading tools and techniques used by savvy option investors the world over. 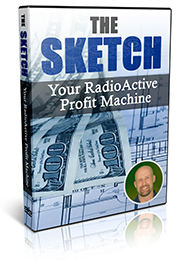 Using the lessons in The Sketch Course, you will be able to apply the RadioActive Profit Machine to lower risk and improve your trading. How to apply the "RadioActive Profit Machine", a unique variation of the traditional married put play. This results in a stock-plus-put position in which you are protected from a large downside move in your stock, but your upside is unlimited. Heads you win, tails you don't lose much. Plus... BONUS: How to use one of TWELVE "Income Methods" to lower the cost basis of your put option, perhaps even eliminating its cost! We call this state "Bulletproof"... when you have no risk remaining but still have upside potential. The "Smiley Face" play... that locks in whatever gain you have now, but promises to make you more money whether your stock moves up OR down afterwards.